Left to right: Brian Morris, Doug Prins, and Rich Schlinkert. 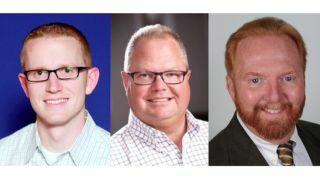 Kramer Electronics has expanded its U.S. regional sales team with the addition of Brian Morris, Doug Prins, and Richard Schlinkert to the outside sales team. The company touted all three as highly qualified sales people with very strong skill sets to complement the existing sales team. Brian Morris, who joined the Kramer family in 2008, has been promoted from his most recent position as the product manager for control solutions to regional sales manager for the Southeast territory. Brian has distinguished himself throughout his career at Kramer, and the move to sales is a natural part of his progression within the company. Doug Prins comes to Kramer as the regional sales manager for the Central territory. Prins brings a wealth of industry knowledge and a passion for developing and maintaining long term customer relationships. He was previously the global account manager for AVI-SPL where he was responsible for strategic sales consulting, business planning, and development. Richard Schlinkert joins the Kramer team as senior sales manager. He comes to Kramer from RGB Spectrum where he was the national accounts manager. His primary objective at RGB Spectrum was to drive the specification of RGB’s video resource management hardware and software. Schlinkert has been immersed in the AV industry for over 15 years.